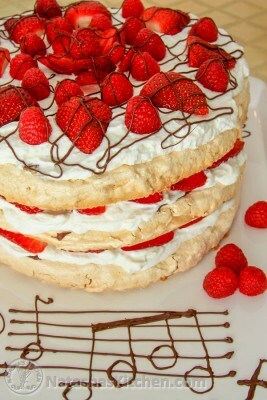 A classic Italian cake - layers of crunch meringue, plenty of fresh berries, lightly sweetened whipped cream and of course, chocolate! Be sure to make the fruit syrup to serve which takes this over the top! Preheat the Oven to 200°F. Draw three 9 1/2 inch circles with pen on parchment paper then flip paper over so you aren't placing meringue over ink. Use pen so you can still see the circle through the paper. Beat Room Temp Egg whites with sugar, 1/4 tsp salt and 1/4 tsp cream of tartar for about 7 minutes on high speed in your stand mixer with the whisk attachment, or until stiff peaks form. Note: if they aren't room temp, they will take much longer to beat. Divide the egg white mix between the three circles on parchment paper. Form the three layers into about 1" tall circles and shape them as evenly as possible. Flatten the top so the layers sit on top of each other easily when you assemble the cake. Bake for 6 hours at 200˚F, rotating the baking pans every 2 hours for more even cooking (mine were on two racks in the upper and lower thirds of the oven). If any of your layers are still springy in the center after baking, turn off the oven and leave them in there another hour to fully dry out. Remove from baking pans and cool to room temp. Freeze the mixing bowl and whisk attachment for 15 minutes. The cream will form best if your bowl and whisk are super cold. Also, keep your cream in the fridge until you are ready to whip it. Beat 3 cups heavy whipping cream with 1/2 cup powdered sugar for about 2 minutes or until stiff peaks form. Refrigerate frosting until ready to use. Rinse and dry berries and slice strawberries the long way. Melt chocolate according to package instructions. As soon as the chocolate is melted, spread it over the tops of each of three layers (see notes for tip #2). Place the first meringue layer on the platter you will be serving the cake on. Spread or pipe a little less than 1/3 of the frosting over the first layer. Place a layer of sliced strawberries over the frosting. Repeat with the next two layers and decorate the top by piping remaining whipped cream and topping with berries and more chocolate if desired. Use a food processor or blender to pulse your thawed strawberries with 1 to 2 Tbsp sugar and drizzle over the top of each slice. 1. Meringue layers take awhile to bake/dry out in the oven so feel free to make them the day before. Let cool to room temp and cover with cellophane on the counter overnight. 2. This cake should be assembled the day you are eating it and is BEST eaten within 2 hours of assembly since the frosting softens the meringue. 3. If you want the cake to stay crunchy longer, brush every layer (top and bottom) with melted chocolate. Once chocolate hardens, it will act as a barrier between the meringue and the cream resulting in a crunchier cake, making it last an extra hour or two at room temp. .
4. If you forget to bring your eggs to room temp, you can place egg whites in a bowl and set the bowl over luke-warm water for 5 to 10 minutes to bring them to room temp, giving them a swirl or two in the process.